Studio based photography is something I have always enjoyed. When photographers call it "too limiting" or say "It's boring using flash", I just smile. Some of the challenge in studio photography is taking the ordinary and then adjusting to make it look completely different. This was a indoor session, done in my garage. I had setup my light for a typical studio headshot, when I decided to challenge myself a little more. I carefully hung a simple piece of plexiglass in front the young lady, and sprayed it with water. I had her shift her position and face towards the light, which I had moved from the right to the left. Our first couple attempts were good but not quite the facial expression I wanted. I asked her to close her eyes, take a deep breath and think of somewhere she love being for a couple seconds. After I let her relax for a couple seconds, I spoke and softly said "Open you eyes and look at the light." Amazing what 5 seconds of relaxation can make happen. With my flash on a stand and angled down on her, the soft light illuminates her as well as the rain drops on the window. Yes, you read the correctly - it is not raining in this image. In fact, it was taken in February 2016 on a 70-degree day with completely blue-bird skies. 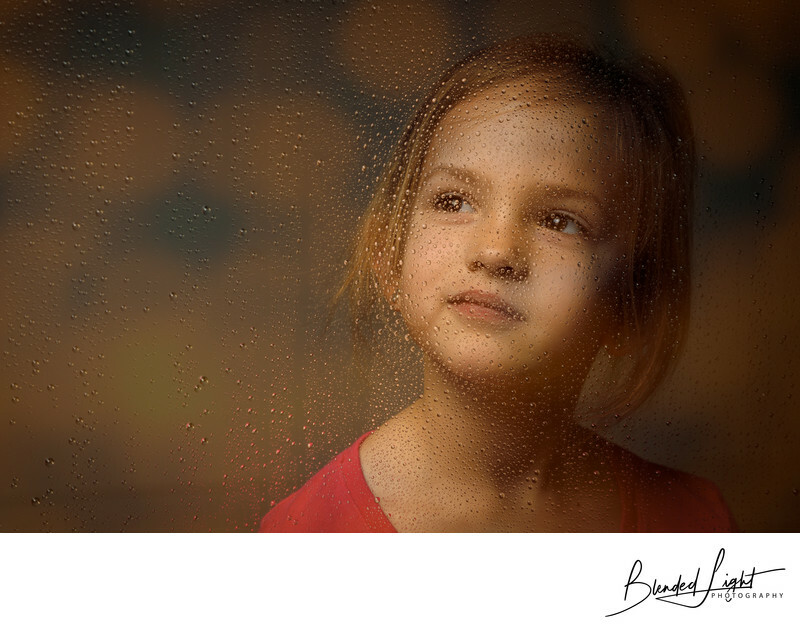 To finish the image off, I took it into post processing where I added a touch of contrast, a bit of warmth and a simple overlay to give the effect of a late afternoon image of this youngster looking out the window in the city on a rainy day. Most people might read this and think the challenge was getting the right facial expression. But it wasn't. Nor was it gettin the right angle of the light or the right height of the light. It wasn't the post-processing and making the image look real and believable. In fact, the toughest part was focusing. Cameras today have become so sophisticated in focusing that they can find some of the smallest obstructions to focus on. The smallest one here? The water droplets. Time and time the camera grabbed them versus my client. So it took a little magic to make this shot happen. Essentially, I had to put the camera on a tripod and manually focus past the water beading down. And once I had focused past that, I let my camera's Live View setting take over. This image is so special to me that it hangs in my living room as a 20" by 30" custom wrapped canvas. You see, that young lady is my daughter. While I've gotten a ton of images over the years of both her and her brother, this was one of the first really standout images I ever created in studio. Printing great images should be of importance to everyone. They are what we hand down as memories long after we are gone. If I can help you create a similar image and have it printed for you, please reach out and let's schedule a time to chat. Location: 9225 Ashton Glen Drive, Zebulon NC. 1/500; f/8.0; ISO 400; 95.0 mm.